Diana Peterfreund’s For Darkness Shows the Stars was on my list of best books of 2012. I called it “a masterfully written novel that explores the nature of love, duty and evolution.” It also just so happened to be a retelling of one of my favorite books of all time, Persuasion by Jane Austen. I admit that I thought to myself, ‘how is she ever going to top that? !’ Then, of course, I found out that Peterfreund’s next book was a retelling of The Scarlet Pimpernel, set in the same world as For Darkeness Shows the Stars. I died. I am dead. The Scarlet Pimpernel was ANOTHER obsession of mine – from high school. I cannot count how many times I’ve read it, and I cannot flipping wait to read this retelling. 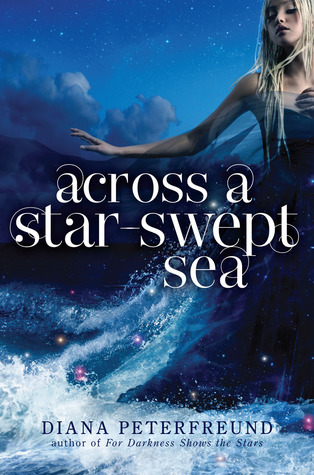 Across A Star-Swept Sea will be released by Balzer + Bray (HarperCollins) on October 15, 2013. I'm excited for this one too, which is a little odd since For Darkness Shows the Stars is still sitting on my shelves unread (this month, I swear!). I feel like I should probably read the classics they're based on, too ;) Great pick! This is on top of my list too, unsurprisingly. Great pick. I love the cover. I have this one on my list too! But I have never read The Scarlet Pimpernel. I don't even have any idea what it is about. Not a clue. You think I should read it before I read this one? I should probably read my copy of For Darkness Shows the Stars for the world building and all shouldn't I? Yeah, probably! Great pick. What the hell is a Pimpernel? Not only does your enthusiasm for this book make me want to read this series, it makes me want to read Persuasion and Scarlet Pimpernel! :D Great pick! This one sounds fantastic. Can't wait for this one, great pick! I wasn't a huge fan of Diana Peterfreund’s Rampant... I don't think I even finished it! :/ but that was years go, and I need to give her books another shot!!! This one sounds awesome! ME TOO CECELIA!!!! I loved For Darkness Shows the Stars so much, I'm thrilled she's doing more of these retellings:) I haven't read The Scarlet Pimpernel, but I hadn't read Persuasion either when I read FDStS and it didn't detract from the story for me. CANNOT WAIT! Great pick! I didn't read For Darkness, but this sounds really interesting and that cover is so pretty! I still haven't read Darkness...so I'm waiting to wait for this one, as it were. I've never read The Scarlet Pimpernel, but I read Persuasion for the first time this past semester at school so I'm curious about For Darkness Shows the Stars!